Day of the Dead (Dia de los Muertos), celebrated on November 2, honors the souls of the dead. The holiday began in Mexico, but has become popular in many parts of the world including the southwest United States. On Dia de los Muertos, family and friends gather to celebrate the lives of their departed loved ones and pray for their spiritual journey. A variety of traditional foods are prepared. 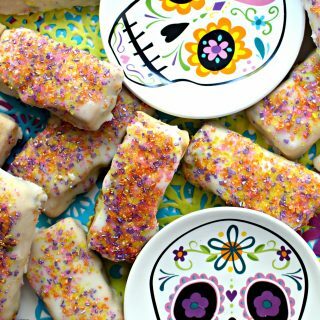 Pabassinas, iced raisin-nut cookies with anise and citrus flavor, are a sweet part of many Dia de los Muertos celebrations. Mexican Dia de los Muertos traditions are a combination of Aztec ritual and Catholic All Souls Day observance. Families create alters, ofrendas, honoring their deceased. Ofrendas include food, candles, flowers, photos, and other tokens. The colors used are symbolic. Yellow, for example, signifies the force of the sun, life, and tragedy. White stands for purity and hope. I have never been a fan of gruesome and gory Halloween activities. I have written before about banning gore and violence from my kids Halloween costumes as they were growing up. As a result, my son may have been the only middle school boy in history to dress up as Gondor (Lord of the Rings), Obi Wan (Star Wars), or Neo (The Matrix). My ban was occasionally met with moans and groans of, “That’s not fair!” but no permanent psychological damage appears to have been caused. My original reaction to Dia de los Muertos, with the “calavera” decorated skulls, was that it was another gruesome celebration, but it’s not. Unlike the decorations of Halloween that are meant to be scary, the symbols of Dia de los Muertos represent rebirth into the next stage of life. I think it is a beautiful and comforting perspective. 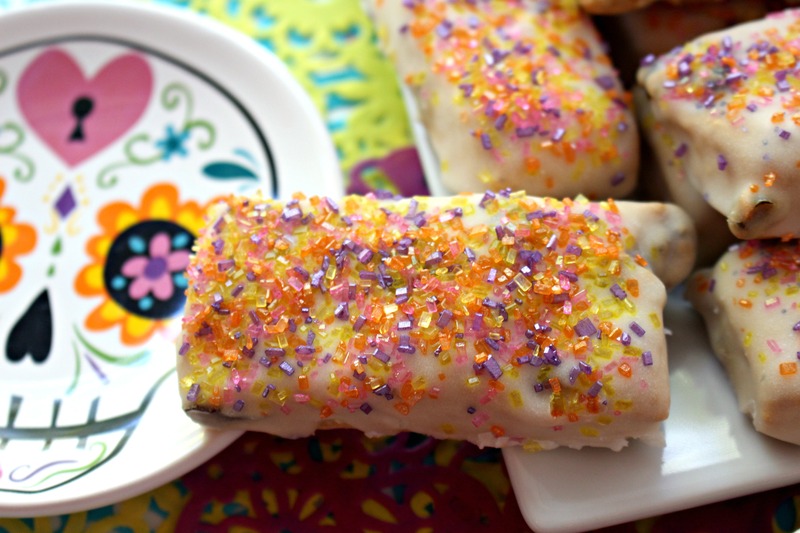 Most of the ofrenda foods, like pan de muerto (a round sweet bread), or tamales, are not care package friendly. Luckily, Pabassinas cookies are! 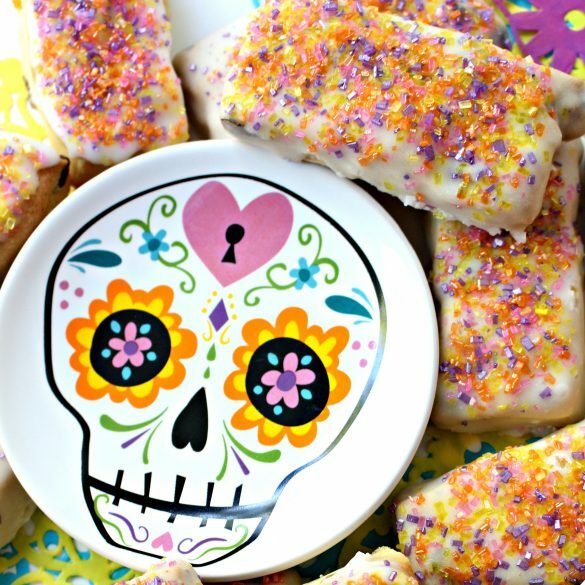 I was able to include this taste of Dia de los Muertos in a military care package to Soldier L. this month. I may even have gone a bit overboard as I enthusiastically baked and acquired care package items, because I ended up filling two Dia de los Muertos boxes! Details of those care packages later this week. Pabassinas are usually contain a combination of almonds and walnuts. I can’t breathe in the same room as walnuts, so I left them out and increased the amount of almonds and raisins. For anyone looking for a completely nut-free version, I made several batches of Pabassinas with raisins only (so that I could taste test) and they were delicious! The flavor combination of anise and orange is fabulous! If you aren’t an anise (licorice) fan, leave it out and the Pabassinas will be less traditional, but still addictive. Preheat oven to 475° F. Line a baking sheet with parchment paper. In the bowl of an electric mixer, whisk together flour, sugar, yeast, and baking powder. Add butter and extracts and beat until mixture looks crumbly (about 1 minute). Mix in 1 cup of water to form dough ball. Stir raisins and almonds into dough. Divide the dough in half for easier handling. On a lightly floured surface, roll out one half of the dough to ¼” thickness. Place the cookies on the prepared baking sheet 1” apart. Reduce the oven temperature to 325° and bake for 20-25 minutes, or until pale golden. Increase the oven temperature to 400° and bake an additional 2-3 minutes until golden brown. Cool completely on wire racks covered with a dish towel. When the cookies are completely cooled, combine all of the icing ingredients in the bowl of an electric mixer and mix to combine. 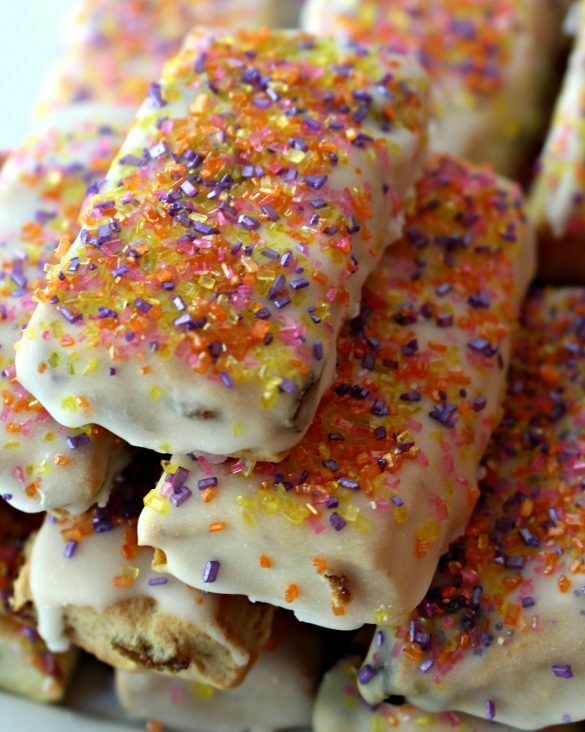 Dip the tops of the cookies into the icing, tap off excess, and place on a wire rack over wax paper. Sprinkle with decorating sugar. Allow to set and harden on the wire rack for several hours or overnight. Once the icing has dried, store cookies in an airtight container at room temperature for up to 10 days. Wrap pairs of cookies, bottoms together, in plastic wrap. Stack wrapped bundles in columns in a freezer weight ziplock bag. Thanks,Reeni! Did you know that you can often buy anise oil (more concentrated than anise extract) at the pharmacy?! I am not sure why, but it costs a lot less than at cake supply stores. I found out when I needed anise oil and baker’s ammonia for making German Christmas cookies (springerle)! Saying hi from the SITS link up. I am super intrigued by this recipe. I used to think I didn’t like anise but now find that when it is baked, it can be really fantastic. Paired with orange — even better! 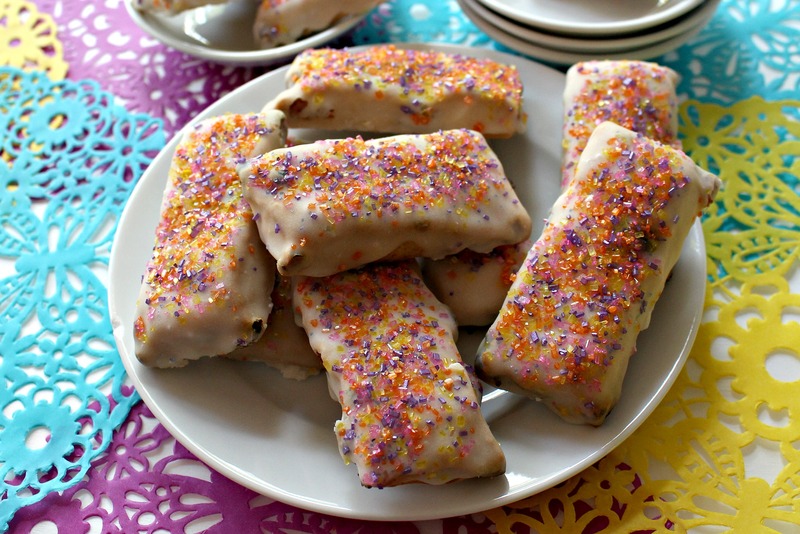 Really like the idea of these cookies – hope to give them a try this weekend! Hi, Beth! I adore anise/licorice in all forms so it’s hard for me to be objective, but I found the orange-anise combo to be amazing! Let me know what you think, if you get a chance to try them. I love discovering new-to-me recipes from around the world! What a fun cookie and I just love the colors! Thanks so much for sharing with us at Full Plate Thursday and have a great week! I’ve never been into the gory side of Halloween either – my son’s costumes were always of the fun variety too! I love anise so I’m really intrigued by these traditional cookies. Thank you for sharing them with us at Hearth and Soul. Scheduled to share on our Hearth and Soul Facebook page later today! These sound so good! 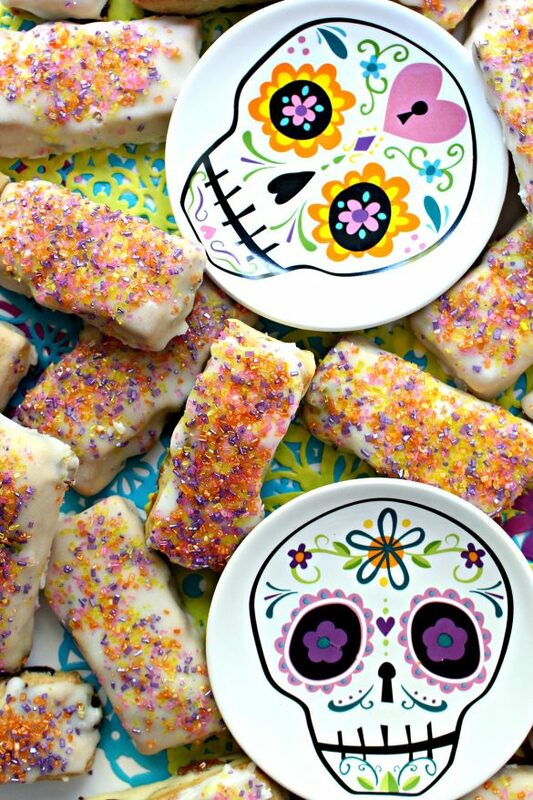 I have never heard of Day of the Dead but I will gladly make these cookies. Thanks for the recipe! Thanks for sharing at the What’s for Dinner party – can’t wait to see what you’ll bring next week. Have a fabulous week ahead.